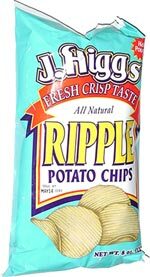 Taste test: These are potato chips with medium-wide ripples  sort of halfway between Ruffles and Wavy Lay's, as far as ripple width. They're not good. They have a very greasy taste.